About two weeks into the season this is usually where some fantasy hockey owners have their first stint of panic. Those at the top of the pool may seem like they’re running away with things, but now is not the time to worry. The season is just getting underway and those who are leading the NHL in scoring at the moment likely will see some kind of regression as the season progresses. However, now might be the time to take advantage of some players who are overachieving early this year. That’s why in this edition of THW’s Fantasy Findings, we’re taking a look at some of the early waiver wire pick-ups that could help your team climb the standings in your fantasy league. Starting with Dobber Hockey’s Ian Gooding, who explains the rarity of picking up a guy like Artemi Panarin on the waiver wire, we get a number of options that might be worth adding for fantasy owners. 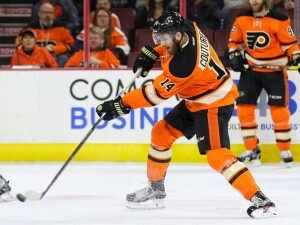 Gooding discusses seven players in his article including Sean Couturier, Jonathan Marchessault and Michael Matheson. But one player that seems to be taking advantage of his opportunity with the Canadiens that Gooding focuses on is defenceman Nathan Beaulieu. The NHL is seeing the emergence of young players. While you can’t strictly rely on the young guns yet for your fantasy team, the time has come where fantasy rebuilds might actually make you more successful as an owner. With the absence of Kulikov and Gudbranson in Florida, Matheson is taking full advantage and the same can be said about Beaulieu. With P.K. Subban out of Montreal, Beaulieu is getting a chance to play on the top pairing with Shea Weber. Coming into the season, Beaulieu had racked up 32 points in 151 career regular season games over four seasons with the Habs. His best season was just a year ago with 19 points (2g-17a) in 64 games for Montreal. Now, six games into the new season, Beaulieu has two assists and a plus-seven rating. While he’s not the best defenceman in the game, he might be one to look at on your league’s waiver wire. Montreal seems to be at the top of their game right now and scoring a young defenceman will help teams in both year-long and keeper fantasy leagues. Like Gooding, fellow Dobber Hockey writer (in association with Yahoo Sports) Steve Laidlaw is leaning towards young waiver wire pickups early in the fantasy season. While he did name some veteran players – including Lee Stempniak, Mike Green and Charlie Coyle – Laidlaw included two 19-year-olds on his list of players to grab in your league. Both Travis Konecny and Zach Werenski were mentioned by the Dobber Hockey writer. While Konecny is only eligible at the center position, he’s played a major role in the Flyers’ lineup so far this season. In the first seven games of his career Konecny has a goal to go along with five assists. He’s averaging just over 15 minutes per game and is showing more promise with every shift he takes. Werenski is much the same. He’s seeing over 21 minutes a game on the Blue Jackets’ back end and has five points (2g-3a) in his first five games with Columbus. Sometimes it isn’t as easy as just picking the top players off the waiver wire. However, in this case, it might be. Laidlaw’s advice to grab both Konecny and Werenski comes with both being among the top available players at their respective positions. To add to that, both players have added some banger stats for those who include them in their fantasy leagues. Werenski and Konecny both have six hits and four blocked shots over the first week and half of the season. While they might not be first players on your watch list when you hit the waiver wire, both of these players discussed in Laidlaw’s piece are great options while they remain hot. For owners trying to build the youth in their keeper leagues, look to Konecny and Werenski for some future success. The growth of youth in the game is just the beginning for fantasy owners.